At TheBookPatch we provide an affordable solution for printing one book, or as many as you want. We even have a free bookstore you can send your customers to so they can purchase your book. We literally charge you nothing for this service other than the cost of printing and shipping – and your readers pay that, you pay nothing! You don’t need these massive self-publishing services that you get charged thousands of dollars for. 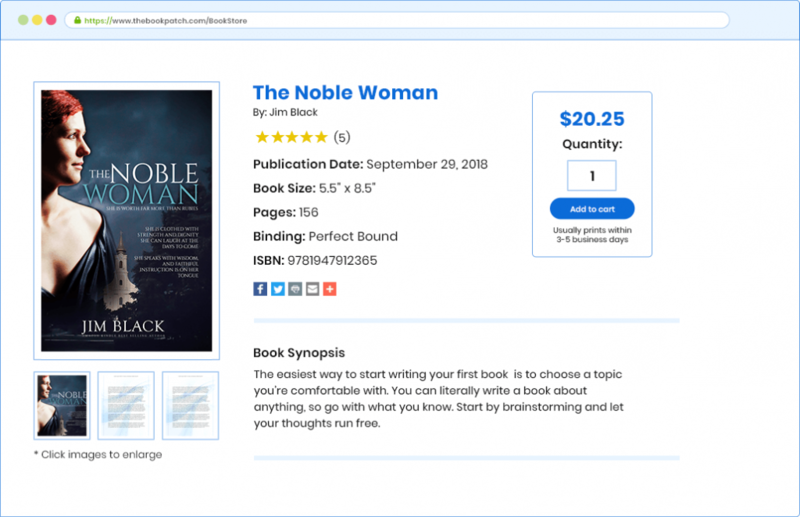 You really just need to get your book printed at an affordable price along with the ability to sell your book without having to worry about the logistics of storing, packaging, and shipping. At TheBookPatch we can sell your book in our bookstore and we take 0% of your profit. You’re an Author, Publisher, Educator, Nonprofit or just have a book project you need printed. Where do you go? You can go on Amazon to get your books printed, however, they don’t do bulk orders, and when you sell your book on Amazon they take over 60% of your retail price. So why send your readers to them? At TheBookPatch we take 0% of your profit. You can go on BookBaby.com and they try to sell you these massive packages you don’t need. When you want to get small quantities of your books printed, you end up paying out the nose for them. Our Print on Demand service combined with our no fee bookstore lets your readers purchase through us after your book has been uploaded. This eliminates your need to keep an inventory or deal with the logistics of shipping. Your readers pay the retail price + shipping and handling. We only keep the cost of printing, leaving you with 100% of the profit. You can start selling now with no out-of-pocket cost. We Have A 99.9% Satisfaction Rating With The Quality Of Our Books. As a New York Times Best Seller myself, I understand the need for quality in everything that we print. This entire business was built on my need for finding high quality, incredibly affordable printing for my personal books. We use a 27,000 square foot in-house printing facility with ultra high speed duplex printing that offers the capability to produce thousands of books a day to ensure your order will arrive to you on time. These top-of-the-line commercial printers also offer exceptional image quality at up to 1200 x 4800 dpi resolution so we can deliver the highest quality books to you.